Here are some examples of various Card Making Ideas you can start with using your own scrapbooking supplies and embellishments. Each of these examples below show cards that are similar. These examples were all made from Club Scrap.com kit supplies and layout suggestions - some with my own twists and some are copies of the Club Scrap examples. Aside from the Holiday seasons, cards are used for Anniversaries, Birthdays, Valentines and Mother's Day. But don't forget that all important, but disappearing, courtesy of the Thank You card. And we also provide some links to Christmas Card Making Tutorials that may show you some new techniques to use on any cards you wish to make. And some awesome Embellishment Ideas at Spirella Designs which are easy to make and look great as an accent on your hand made cards. 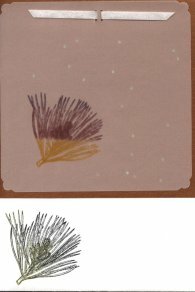 And for other card ideas, check out our page on Dicrofiber Scrapbook Embellishments. The following 5 cards used paper and embellishments from the Club Scrap kit from June 2007 called "Chapter One." A tan color card with a blue front panel cut to fit so the tan frames it by 1/8 inch all around. 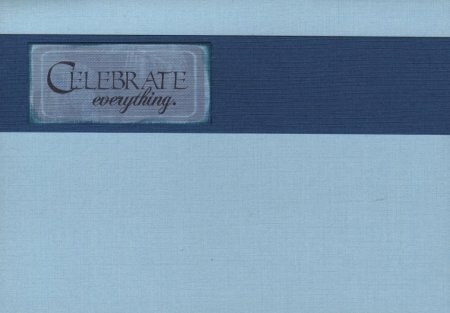 The blue and tan frame embellishment on the front announces "Happy Anniversary." Two eyelets on the side, added at an angle, hold the blue ribbon. This "Birthday" card uses the same color combination with an frame-in-frame to announce "Birthday." This third card from the Chapter 1 collection has a patterned frame with holes punched and tan colored paper fiber tied on the front. A great card to write your own sentiment both on the outside and inside. These two "Gatefold Style" Card Making Ideas open in the center. The one on the left made from red card stock has 2 front panels in the tan cut slightly smaller that the red folded over sides. 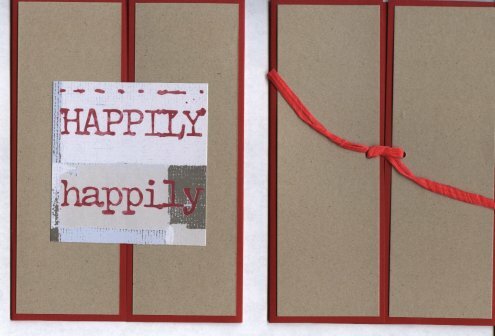 The embellishment "happily, happily" can be used for birthday or almost any occasion. The embellishment tag is only attached to the left panel so the card can be opened. The card on the left is also made from the red card stock, and also has the two tan front panels, but is held together with a paper fiber run through two eyelets in the right and left panels. Untie the fiber to open the card. Below are three cards made using the Club Scrap kit from Color in Black & White from April 2006. These Card Making Ideas show no greetings, but they have been used for everything from Christmas cards to Birthday and Thank You cards. A very simple card here. The card itself of copper metallic stock with a transparent vellum front panel attached with ribbon at the top. The corners of the vellum panel were shaped with a corner shaper to make a decorative edge. 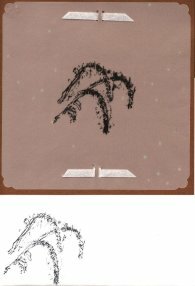 The rubber stamp of the pine bough was heat embossed with dark green embossing powder. The envelope below the card was also heat embossed to match the card. 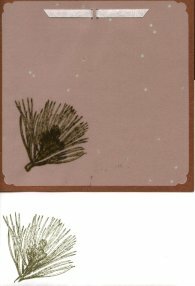 This card is almost exactly the same except the pine bough was stamped in two colors of ink and heat embossed with clear embossing powder. This card, again similar to the first, but more summer oriented than winter with a rubber stamped and heat embossed floral image. This time the image is in the center with two ribbons attaching the vellum panel. Again the corner of the envelope is stamped to match the image on the card. 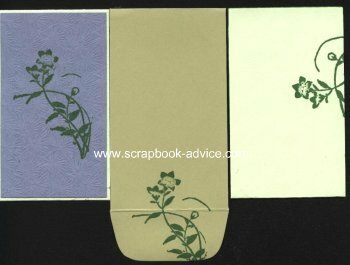 Here is another interesting and very simple card making idea using Club Scrap's kit from May 2006 called "Natures Wonders." This little gift tag on the right was made from ivory card stock with a blue front panel and has a small floral image stamped on the front of the card. The inside of the card is shown on the right, again with part of the rubber stamp image. Below are some more Card Making Ideas from Club Scrap's kit from September 2008 called "Cyprus" with a Greek Theme. Here is a very simple card idea. The light sea blue card panel with a simple 1 inch strip of white card stock. The white strip is rubber stamped with the Greek Key image in a matching blue ink. The Happy Birthday tag was from the Club Scrap Greetings to Go Kit. 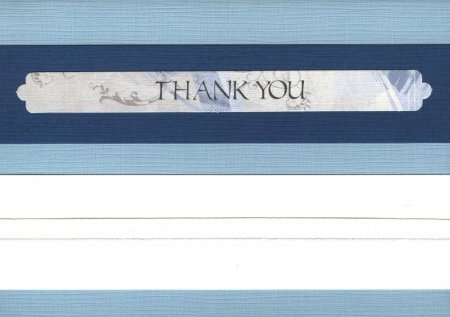 This Thank You card uses the same light blue cardstock, with the same white strip combined with a dark blue strip above. There is a white ribbon running across the white card strip. The Thank You embellishment came with the Club Scrap Greetings to Go option. 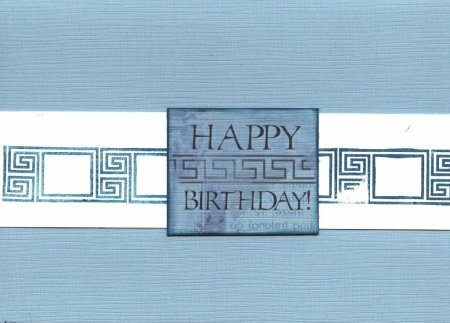 Another Birthday card using the dark blue and white strips nested together. 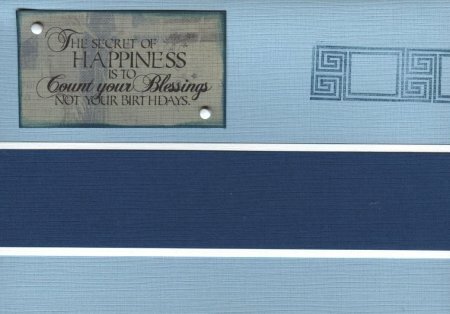 The birthday message says "The secret of happiness is to count your blessings not your birthdays" has the edges inked and is attached with two white brads. Part of the Greek Key stamp is on one side. This below is actually the inside surprise of the Birthday card above. These next 3 Card Making Ideas were done using the Club Scrap Greetings to Go set from the January 2007 Monthly kit called "Fizz." It was such a hit in the Pink that it was recently re-released with the same patterns in Blue. 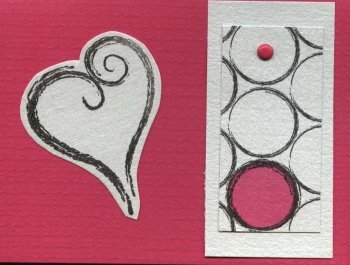 This first card of dark pink card stock is very simple with layered solid and printed card stock pieces with one pink brad to accentuate the center of the circle. 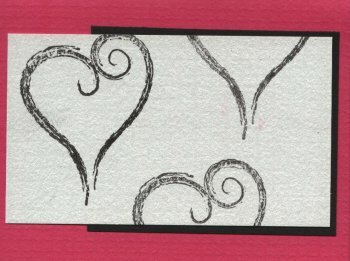 The heart image was rubber stamped in black on the white metallic card stock and hand cut around the image before taping to the front of the card. This next pink card has layered black and white metallic panels cut to different shapes. The heart image was stamped in black ink multiple times on the white panel. 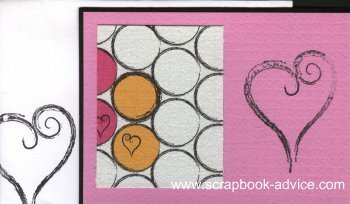 This third card from the Fizz kit, shows layered panels of the solid and printed papers with the smaller heart image rubber stamped in black ink on both the card and the envelope. Start with something very simple using up the little scraps from your scrapbook layouts. Then as you get more comfortable, branch out and be creative. Don't forget it is OK to copy as long as you are using these for personal use. There will be more to come to help you celebrate the next World Card Making Day. Spirella Designs for interesting embellishments for your cards.